And More-Susan G Komen Race #ReliefinAction - Chocolate Chocolate and More! This post is brought to you by Advil and BlogHer. I am participating in a sponsored campaign hosted by Advil® as part of the Advil® Relief in Action campaign. I received compensation for this post. While all opinions stated are my own, I make no claims about Advil® as a product or its effectiveness.I know this isn’t food; I promise I’ll have more food for you soon, but I wanted to share this with you. My girls and I did our first 5K race. It’s probably not fair to call it a race. We more walked than ran this 5K. But this really wasn’t about our speed anyway. It was about getting involved and being part of making a difference. Here’s a little back-story. We live in small town-Byron, Georgia. 5 Traffic lights (we got a new one) and 2 of them are for the interstate ramps. Two years ago, The Susan G. Komen Race for the Cure, had to find a new home. The “big town” just to the north of us didn’t want them anymore. It caused traffic issues, it wasn’t good for the businesses, and I’ve heard a few other lame excuses. Anyway, our small little town jumped at the chance to host this amazing event. The first year it went pretty well. A few minor issues about locals not knowing when the roads would close down but overall, a great experience for all involved. So this year when talk started about the race, I knew I wanted the girls and me to do it. My girls are 14 and 11, old enough to understand what Cancer can do, and what we, as just one person, can do to help find a cure. Having the race in our hometown just made the experience that much sweeter. There is a bond among women; it starts the very second someone calls us pretty or cute or adorable when we are just a tiny little thing. We realize we’re girls. For life. And when something affects a female part of our bodies, it doesn’t matter how old or young you are or what body shape you may have, we are sisters, and we all feel the pain. I’ve been a spectator at other 5K events and let me tell you, being in a sea of pink just brings out the girl in you. It also unites you with complete strangers. My girls didn’t get all emotional like I did watching the balloon release but one day they will. I’m so thankful for all the survivors out there, and hopeful for those still fighting the battle. My girls don’t realize truly how amazing this event was. Not just for a great cause but for the community spirit. Our community brought the spirit of the Advil® Relief in Action campaign to life. The campaign honors volunteers who don’t let pain stop them from giving back, and our town pulled out all the stops to help honor and celebrate the survivors and racers. The route took us through one of our residential neighborhoods. 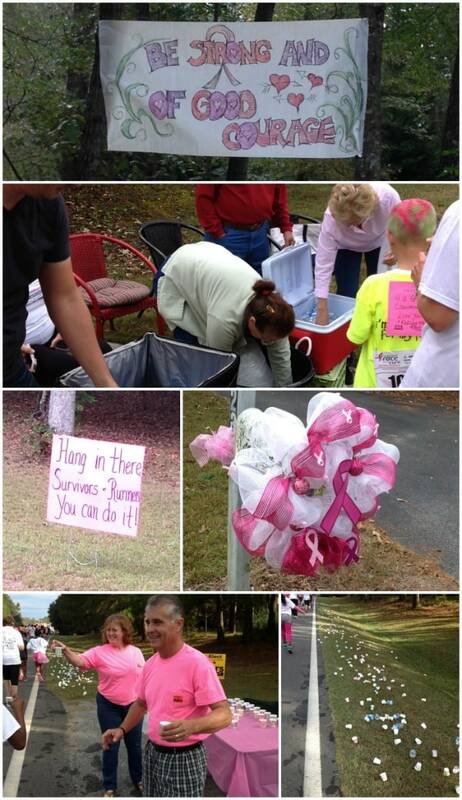 People (our friends and neighbors) decorated their mailboxes, put up signs, gave out water and cheered us on. This race wasn’t an inconvenience. It was a privilege. Our community made a difference just by welcoming the race onto our streets. I was so proud for my girls. They completed the race and are already excited for the next opportunity. The next chance to show they care and support something they believe in. And I’m proud of the town I live in, the people that I get to call neighbors and friends and the community that steps up and does their part to make a home for an event that means so much to so many.